Shoulder replacement surgery is a safe and effective treatment option for patients with severe shoulder arthritis. To learn more, continue reading or schedule an appointment at Dr. DuBois’ La Mesa, CA offices. The shoulder is a ball-and-socket joint, comprised of muscles, cartilage, ligaments, and bones that work together during routine movement and recreational activities. Collectively, the shoulder's components are responsible for lifting the arm and rotating it through an extensive range of motion. 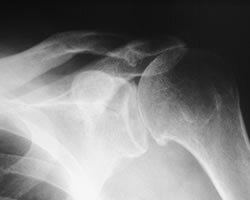 Damage to the shoulder's supporting structures and protective cartilage is common, as the joint is fairly unstable. Its unstable nature makes it prone to injury and dislocation, through both everyday uses and strenuous activity. These injuries can eventually lead to a condition known as osteoarthritis, a degenerative joint condition that painfully breaks down the bones. The basic shoulder joint is comprised of two bones: the humerus, or upper arm bone, and the scapula, or shoulder blade. The round head of the humerus fits into a socket on the scapula called the glenoid fossa. These bones form the glenohumeral joint, naturally unstable due to the fit of the bones. To describe the fit of the ball within the socket, the glenohumeral joint is often compared to a golf ball sitting on a golf tee. To provide greater support to the unstable joint, a ring of cartilage called the labrum lines the outer ring of the socket and provides additional depth. The surfaces of the two connecting bones are also covered with cartilage that helps the bones glide against one another during movement. This cartilage prevents friction and makes motion painless. Routine function and athletic training can eventually damage the shoulder's components, causing a number of debilitating symptoms. Repetitive activities can wear down or tear the joint's protective cartilage, as well as supporting structures like the rotator cuff muscles or joint capsule ligaments. When damaged, these components cause pain and limit mobility. Ultimately, these damaged components contribute to the development of osteoarthritis, a degenerative joint disease that breaks down the bones. Osteoarthritis is a "wear-and-tear" condition, and usually affects older patients who have had previous shoulder joint injuries. This can include overuse injuries incurred during sports, such as pitching in baseball, as well as traumatic events such as a car accident. Many patients may develop osteoarthritis as a result of routine motions that gradually wear down the shoulder's components. Patients with occupations that involve overhead activities, such as painters or carpenters, are more at risk of injuring their shoulder due to everyday labor. These symptoms can make simple tasks difficult, such as buttoning a shirt or grabbing an item from an overhead shelf. Patients may find everyday tasks or job functions more challenging than usual, reducing health-related quality of life. Many patients manage arthritic symptoms through conservative treatments, which aim to alleviate the role of the damaged component and strengthen the surrounding muscles and ligaments. Additionally, many treatment options aim to reduce inflammation and encourage regeneration. Patients with severe arthritis may require replacement of the damaged joint to alleviate pain and restore motion. Joint replacement therapy is one of the most commonly performed surgeries in America today, and can often return patients to previous levels of activity. 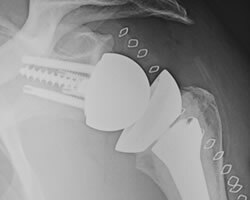 Shoulder replacement surgery involves the removal of the arthritic joint and replacement with a prosthetic implant, made of metal and hard plastics, that aim to imitate the function of the natural joint. The humeral head is removed and capped with a metal component. The glenoid fossa (shoulder socket) is resurfaced to remove any arthritic bone, with a new socket fitted in place. Once set in place, the patient's new shoulder joint should allow for a wider range of motion with less pain. 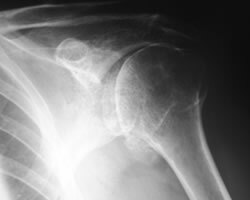 For some patients, shoulder arthritis coupled with a severely torn rotator cuff, known as “cuff tear arthropathy,” rules out traditional shoulder replacement as an effective treatment option. The shoulder replacement procedure outlined above, in which the ball and socket components are replaced with new prosthetic components, may result in pain and limited mobility after surgery for these patients. In these cases, reverse shoulder replacement may be the best option to restore joint functioning and limit pain. 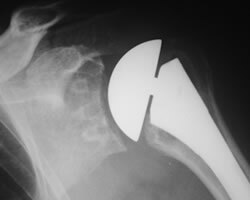 Reverse total shoulder replacement is similar to traditional shoulder replacement; however, the placement of the ball-and-socket components is reversed. The humeral head is removed and replaced with a socket component, while a metal ball is fixed to the glenoid fossa. Reverse shoulder replacement relies on different muscles to move the arm, and so it tends to be a better option for patients who have severe tears on the rotator cuff. Because traditional shoulder replacement components rely on the rotator cuff muscles, these patients will typically experience pain whenever trying to use these muscles. Dr. Benjamin DuBois is an expert shoulder surgeon practicing in San Diego, serving patients in the nearby communities of La Jolla, Del Mar, Coronado, and El Cajon. With fellowship training in shoulder and elbow surgery, Dr. DuBois is one of the area's leading shoulder surgeons, and takes a keen interest in shoulder replacement surgery and rotator cuff disorders. For more information about treating shoulder arthritis, schedule a time to speak with Dr. DuBois at his offices in La Mesa, CA at the Grossmont Orthopaedic Medical Group.